Check out the videos below of the CNN town hall (with inserted commercials) and a recent interview on Pod Save America, along with an article today from the Washington Post! I think he may be my favorite at the moment! WEST HOLLYWOOD, Calif. — Pete Buttigieg — the mayor of South Bend, Ind., who is running for president — won’t wear his dress jacket, not when he appears on national television for a town hall meeting, not for photo shoots, not even at a fundraiser here in a Russian-themed bar where he’s mingling with such celebrities as comedian Billy Eichner and Olympic diver Greg Louganis. “There’s a side controversy over that question,” Buttigieg said in an interview. No less a figure than David Axelrod, the top strategist for the past two winning Democratic presidential campaigns, has been privately urging the 37-year-old to look more grown-up by wearing a jacket on the campaign trail. The Navy veteran with a hard-to-pronounce name, from a city small enough to fit every resident in a college football stadium, seems to be winning the argument at the moment. Weeks after declaring his interest in challenging President Trump, he has become, if not exactly well-known, a subject of interest for many Democratic voters, buoyed by a breakout performance at a CNN town hall on March 10. His moment came just days before another youthful candidate, former congressman Beto O’Rourke of Texas, grabbed the spotlight by announcing his entrance into the race. Buttigieg downplayed the impact of a rival fresh face joining the fray, joking that he has the “white Episcopalian gay veteran” lane to himself. 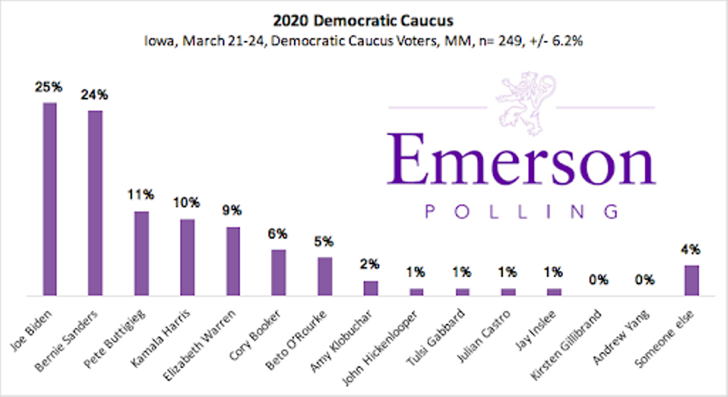 New Iowa poll has Pete Buttigieg in 3rd place in Iowa, ahead of Harris, Warren and Beto! The secret is getting out! In the 2 weeks since I started this thread, Pete Buttigieg is exploding! He is consistently wowing interviewers including Charlamagne tha God to Van Jones and Chris Wallace (OK, Chris Wallace who is great, IMO, despite being on Fox, was merely impressed), and recently got a very positive writeup in the New York Times! His thoughtfulness, eloquence, and authenticity are captivating! He's unabashedly liberal but presents it in a way that is much more compelling and acceptable to people who can appreciate our values but haven't aligned with our policies yet. Typical of the was buzz was a tweet from former Rep. Joe Scarborough reacting to Buttigieg’s appearance on Morning Joe recently. As a 37-year-old, gay mayor of a mid-western city that is almost half the size of Santa Rosa (102K vs 175K) I first thought he was a charter member of the clown car brigade. But once you listen and watch him, he comes off as the person with the most gravitas in our wide field of candidates! Among the items in his "comically overstuffed resume" in high school he won a national essay award for an essay in praise of... wait for it... Bernie Sanders! I think his toughest challenger will be the very same Bernie Sanders who is 40 years older than Mayor Pete. I consider their values and impeccable integrity to be similar, but I think Mayor Pete is a more compelling and durable messenger. Mayor Pete's young age can be perceived at first to be a detriment. But to hear him address this concern, you come around to believing he has more than enough maturity that is needed (especially as compared to our current toddler-in-chief) and his millennial fresh ideas and commitment to addressing climate change are on balance an asset! On the other hand... Bernie will 79 years on Inauguration Day, 2021... and 83 years old should he win a second term... and 87 years old at the end of his second term! I'm sorry, but that's too old! I think Mayor Pete, who will be 39 years old on Inauguration Day, 2021. Age aside, I think Mayor Pete comes off better. Bernie had his moment in 2016 when he was 4 years younger and his clarion call for political revolution had its perfect foil in Hillary's relatively centrist campaign. But his political revolution has now been joined by many others (ie his revolution succeeded!) and like Moses, I think his destiny is to lead the way to the promised land, if not actually lead us into liberal nirvana. Even though Beto is almost 10 years older than Pete, Beto comes off as an excitable college student and his rhetoric doesn't have the intellectual heft that Pete's does. Even his newlywed husband is gaining rave reviews! I encourage to watch some of the videos and see what I am talking about. Please post your comments! If you agree with me that he is the best, if rather unlikely, candidate and that if he wins the Democratic nomination, that he's also likely to beat Trump, (that sure would be fun to watch!) then I suggest you take advantage of your early insight and join me on betting on it! There's a reputable sports betting site called https://www.bovada.lv/. Turns out they have a hard to find politics betting page. I placed a bet last week when the odds were 33 to 1! Currently, they are 28 to 1. With those odds, I think it's still a good bet! I'm personally a big fan of his. What he's accomplished in South Bend is very impressive. And he and his other many talents and skills are extraordinary. I watched some of his town hall meeting broadcast from Austin and was very compelled. He is fresh and different in many ways that are appealing, while also being brilliant, humble, and just a hell of a nice guy. I'm excited to see his buzz growing. Also, Chasten is just absolutely damned adorable. His Twitter feed ... and that of their rescue dogs (!) are crazy charming. David Brooks of the New York Times just published a good piece on Buttigieg, "Why You Love Mayor Pete"
I agree! While he is very progressive, he is not combative. He's not demonizing anybody (well maybe Trump, but he avoids talking about him). Where Bernie, Elizabeth and Kamala are all about fighting, Mayor Pete calls us to our higher selves. I'm really nervous about the state of the country with both sides frothy with anger. If Bernie wins the right will be apoplectic about socialism, whereas if Mayor Pete wins, although some on the right will freak out because he is gay, many will be soothed by calm and compassionate nature. If you haven't taken the time to watch one of Mayor Pete's extended interviews, his latest one in front of an enthusiastic overflow audience at Northeastern University in Boston is a fine place to start. See why he is on fire!